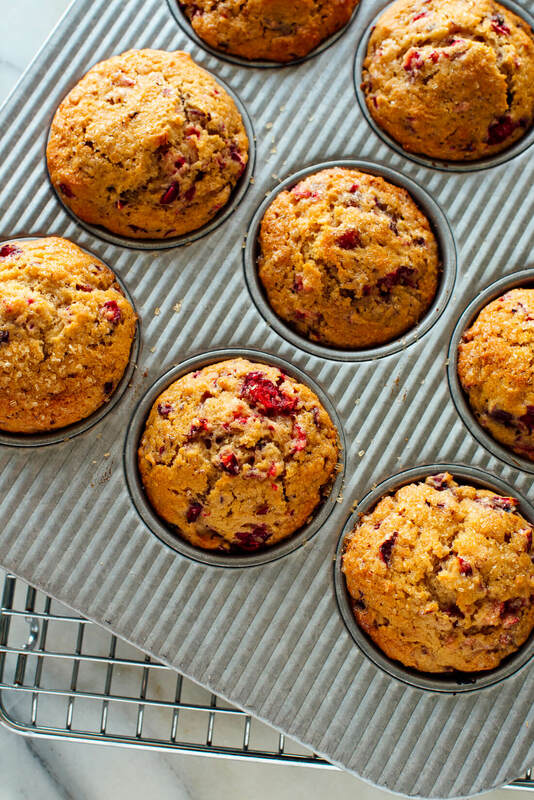 These fluffy cranberry orange muffins will make your house smell like the holidays! I hope they become your new favorite holiday muffin recipe. It took me eight tries to get these muffins just right, but they were absolutely worth the effort. 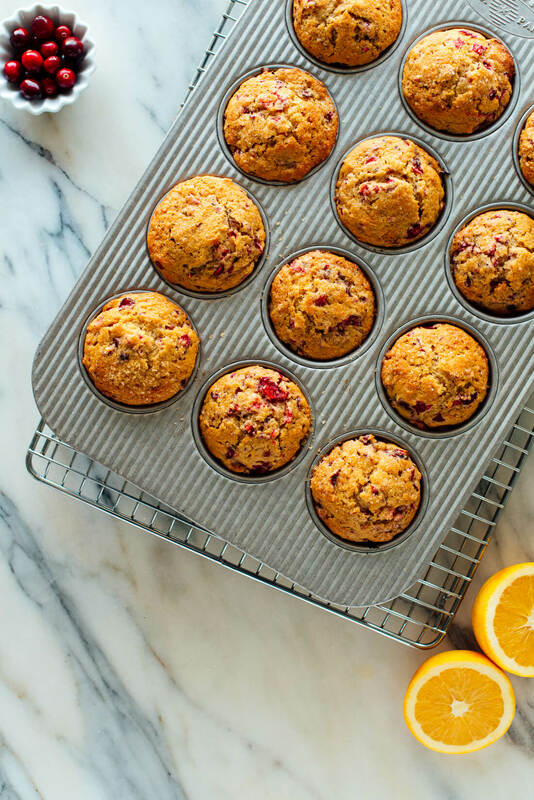 These muffins are bursting with fresh cranberry and orange flavor. They’re fluffy and moist and delicious—everything I want a muffin to be. Plus, they’re made with wholesome ingredients like whole wheat flour and Greek yogurt, and they’re naturally sweetened with honey or maple syrup. You can keep those details to yourself, though—no one will guess that these muffins are healthier than most! Did I mention that you can easily mix these together by hand? No mixer required. Serve them for breakfast or brunch, or bring them to your holiday parties this year! I thought this recipe was going to be so easy. Take my blueberry muffin recipe, substitute cranberries for the blueberries, add orange zest—done. Not so fast, Kate! Problem: The fresh cranberries were so much bigger than blueberries and so tart that they left mouth-puckering polka dots in the muffins. Fortunately, I found a clue in America’s Test Kitchen’s cranberry muffin recipe. 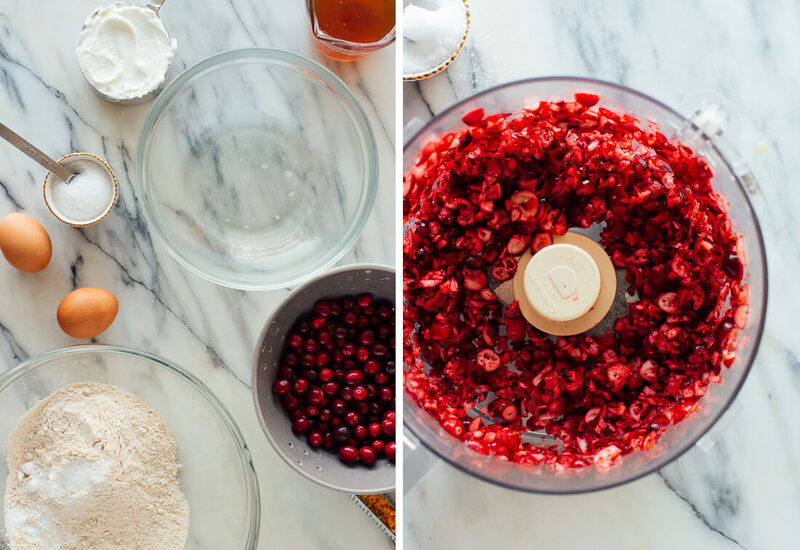 Solution: Blitz the fresh cranberries in a food processor for a few seconds to break them up. That way, you get delicious little bits of cranberries in every bite. This also allowed me to double the amount of cranberries for maximum cranberry flavor. Problem: The muffins were still far too tart, though (and I like tart). Solution: To counteract the tartness of the cranberries, I added 1/4 cup more honey or maple syrup, which made these muffins perfectly sweet—not too much, not too little. Solution: I went back to the original formula and added 1/4 cup more flour. The muffins rose like a dream! Eight tries later, I landed on perfect cranberry orange muffins! I hope you’ll make them while cranberries are still in season. White whole wheat flour or regular whole wheat flour: Either one will work. White whole wheat flour (available in health food stores or well-stocked grocery stores) is made with white wheat berries instead of red, and has a more mild flavor as a result. As long as your whole wheat flour hasn’t been sitting on the shelf too long, your muffins will not have a strong “whole wheat” taste. In fact, if your flour smells rancid or your muffins taste bitter, your flour has gone bad. You could also substitute all-purpose flour or Bob’s Red Mill’s gluten-free all-purpose blend. Pro tip: The proper way to measure flour is to spoon flour into your measuring cup and level off the top with a knife. Do not scoop flour into your cups, or you could end up with way too much flour, and dry/tough muffins. Baking powder and baking soda: These are leavening agents, which help the muffins rise so they are light and fluffy. These ingredients are not the same thing and are not interchangeable, so be careful with your measurements! Fine sea salt: I prefer to use non-iodized sea salt instead of plain table salt because it has a cleaner taste and contains some good-for-you trace minerals. You can substitute regular salt if that’s what you have! Coconut oil or extra-virgin olive oil: Instead of butter, these muffins call for oil. I can’t taste either one in the end result. If you use olive oil, I recommend a mildly flavored one, like California Olive Ranch’s Everyday variety. Honey or maple syrup: Instead of sugar, these muffins are naturally sweetened with honey or maple syrup! These do impart some delicious flavor, so choose your favorite. Eggs: Eggs also act as a leavener, helping the muffins rise while also imparting richness. If you have an egg allergy or you’re a vegan, you can substitute flax eggs (see recipe notes). Greek yogurt: Yogurt replaces sour cream, but offers the same delicious richness and tang. Yum! Check the recipe notes for a buttermilk alternative (which can be made vegan). Vanilla extract: You know, for some luscious vanilla flavor. Orange zest: All you need is the zest of one orange to infuse these muffins with flavor. After you take the zest off the orange, you can slice it up and eat it. I do recommend buying on organic orange if you can find one, since pesticide residue sticks to the rind. Fresh cranberries: One bag is more than enough. You’ll blitz these in the food processor before folding them into the batter. Turbinado (raw) sugar: This is optional, but I recommend it. Turbinado sugar is large crystal sugar that lends an irresistible sparkling, crunchy top to the muffins. I bet you could even take a tiny bag of raw sugar home from your local coffee shop! USA-made muffin tin: This sturdy muffin tin bakes beautiful muffins and has a non-toxic, non-stick silicone coating. I never have to grease the cups! 11-cup food processor: This Cuisinart is not too big or too small, and blitzes the cranberries in five seconds. Microplane: It’s so easy to remove the zest from citrus with this handy tool. Here are more of my favorite naturally sweetened, whole-wheat muffin recipes! Please let me know how these muffins turn out for you in the comments! I love hearing from you, and hope the recipe is a big hit. 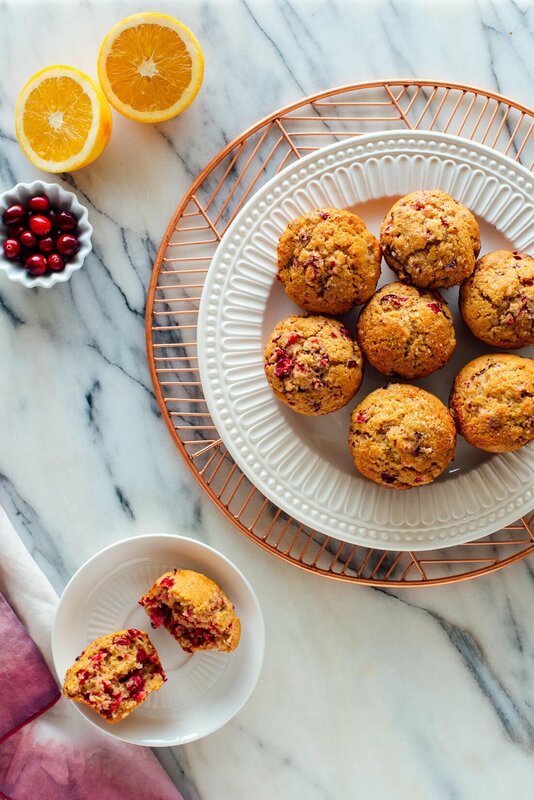 These cranberry orange muffins will be your family’s new favorite! Don’t tell them the recipe calls for healthy ingredients. 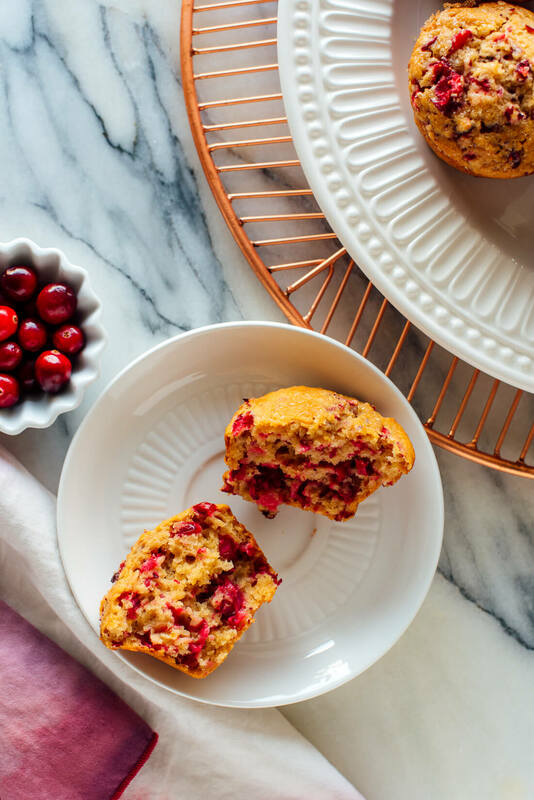 These fluffy muffins are bursting with fresh cranberry and orange flavor, plus they’re whole grain and naturally sweetened! Recipe yields 12 muffins. Preheat the oven to 400 degrees Fahrenheit. Grease all 12 cups of your muffin tin or line them with papers, if necessary. 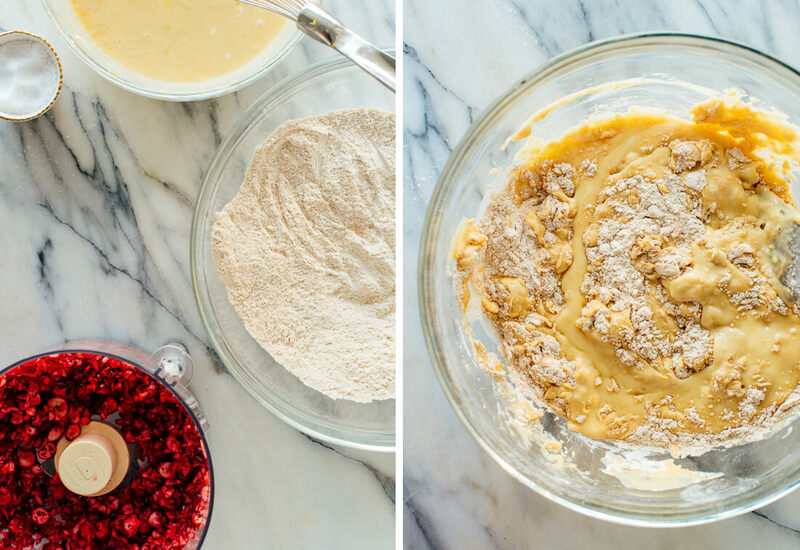 In a food processor, process the cranberries for about 5 seconds, until they are broken into little bits (but not puréed—see photos). Set aside. In a large mixing bowl, combine the flour, baking powder, baking soda, and salt. Stir to combine. In a medium mixing bowl, combine the oil and honey and beat together with a whisk. Add the eggs and whisk to combine, then add the yogurt, vanilla and orange zest. Mix well. Pour the wet ingredients into the dry and mix with a big spoon, just until combined (a few lumps are ok). 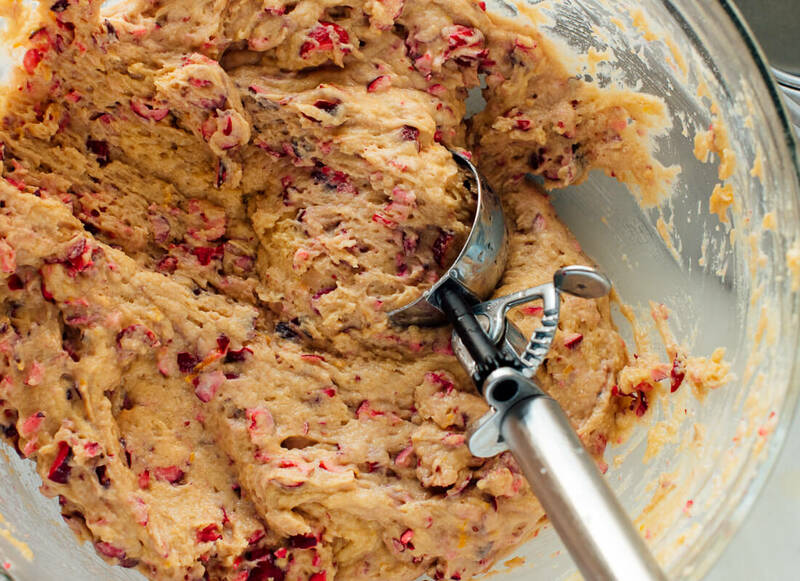 Gently fold the cranberry pieces into the batter. Divide the batter evenly between the 12 muffin cups (they will be quite full). Sprinkle the tops of the muffins with turbinado sugar. Bake the muffins for 15 to 18 minutes, or until the muffins are golden on top and a toothpick inserted into a muffin comes out clean. Place the muffin tin on a cooling rack to cool. You might need to run a butter knife along the outer edge of the muffins to loosen them from the pan. If you have leftover muffins, store them, covered, at room temperature for 2 days, or in the refrigerator for up to 5 days. Freeze leftover muffins for up to 3 months. Recipe adapted from my healthy blueberry muffins. *Note on Greek yogurt: I’ve used a variety of fat percentages and the muffins have always turned out well. Higher fat yogurt will yield a somewhat more rich muffin. You can also substitute plain (not Greek) yogurt, but your muffins might not rise quite as high. Make it vegan: You can replace the eggs with flax “eggs.” Replace the yogurt with a smaller amount of vegan buttermilk—just mix ⅔ cup non-dairy milk with 2 teaspoons vinegar. Let it rest for 5 minutes before adding it to the other liquid ingredients. Or, use 1 cup thick vegan yogurt. Make it dairy free: See buttermilk option above. Make it egg free: Substitute flax eggs for the regular eggs. Make it gluten free: Substitute an all-purpose gluten-free flour blend for the whole wheat flour. Bob’s Red Mill makes a gluten-free blend that works well. These sound AMAZING! I’ll definitely be trying them. Could you substitute oat flour? There’s a flavor to the GF all-purpose that I cannot get around no matter what. I’ve thrown away so many baked goods hoping each would be different but something just tastes awful to me in the flour. I’m not sure what it is :-/ I’m not 100% GF but I try and make substitutes as much as I can. Hi Christine! I wonder if the flavor you don’t like is chickpea flour; it can smell/taste oddly metallic. Anyway, oat flour *might* work. I suspect your muffins wouldn’t rise as high but they might be good! Please let me know if you try. You might also enjoy my friend Tessa’s blog, saltedplains.com—she has tons of gluten-free desserts and baked goods that don’t call for GF blends. Thank you for the suggestion! Her recipes look amazing :-) I’m not sure what it is about the GF All-Purpose Flours. I had pancakes at a restaurant before that were made with Garbanzo flour and they were amazing. So I honestly don’t know. these were delicious! i made them after i saw your post instagram and couldn’t get enough. will definitely make more when i have time. These look wonderful! I have been in search of just such a recipe that might also include grated zucchini along with these very ingredients for “seasonal color” and an additional healthy boost. Do you have a recommendation about how that could be done to keep the integrity/correct texture in the muffins? Hi Donice, that’s a fun idea and a good question! I just cross-referenced my zucchini muffin recipe. I *think* you could add 1/2 cup grated zucchini, squeezed of excess moisture, without changing anything else. Adding any more might change the moisture levels. Hopefully that’s enough to add some green flecks. Please let me know if you give it a try! Thank you, Kate, for your reply regarding the addition of zucchini. I’ll let you know how it goes! I love your email-recipe blasts. This morning’s that came in for the cranberry-orange muffins excited me because I had all the ingredients on hand. My husband who is extremely finicky even tried them and exclaimed “you outdid yourself.” Then the next door neighbors said they smelled something yummy baking, so I brought some over to them, and their reply was “OMG”! I used olive oil and honey options. Thank you – very seasonal, easy and delicious! Hello- these look amazing. I am wondering if you tested these as vegan with the substutions you noted. I would love to take these to a brunch this weekend and won’t have time to test. Hey Hallie, I have tested those substitutions on a very similar muffin recipe and they worked great (if I were just guessing I would indicate that). I’m confident they will work well for you. Please report back if you try it! Looking forward to trying this recipe! Have you made them with oat flour? Or any recommendations if I try it? I haven’t made with oat flour, sorry! You’re so kind, Lynda! Thanks for your faith and review. Hi Kate, I am in Australia and we have access to dried cranberries. Do you think I could substitute those for fresh cranberries in this recipe? Keep posting, I love your recipes and cook many favourites! I am also wondering about substituting dried cranberries for the fresh as that is what I have on hand and would love to make these muffins! Hi Bev! Good question. Since dried cranberries are already sweetened (so they retain some moisture) I would recommend going back to my standard flour and sweetener amounts (I had to increase both in order to obtain sweet-enough muffins since raw cranberries are so tart). So I’d suggest using about 3/4 cup dried cranberries, 1 3/4 cups flour and 1/2 cup honey or maple syrup. Please let me know if you give this a try! Thank you for not giving up on these!! Cannot WAIT to try these out! Be sure to let me know what you think, Rachel! Love your recipes. Have tried many! Wanted to let you know you have Canadian followers. Thank you, Penny! Let me know what you think why you make these muffins. These muffins are delicious! I just made them tonight and already ate 4 :D Thank you for such a great recipe! Thanks for trying them already! I appreciate it, Catherine. Glad you love them! These muffins look so moist and delicious! Perfect for brunch! I agree! Great option to have at brunch. These look amazing. Thanks for the trial and error to get them right! Would I need to modify anything to make a quickbread instead? Hi Anna! I think this would make a lovely quick bread. I would keep the oven temp the same. Not sure how long to bake, maybe 40 minutes? Please keep an eye on it starting at 20 just to be safe. Thanks for sharing what you thought and your substitutions, Marianne! I appreciate the review. Made these tonight! AH-MAXING!! I Subbed spelt flour for half of the whole wheat flour foe some added nutrients. Love this recipe! It’s great for breKfast because it’s not too sweet. Thanks for posting, Kate. Wonderful, Olivia! I’m glad you love this muffin recipe. I love cranberry and orange together so much! Such great content! Love your recipes and ideas! 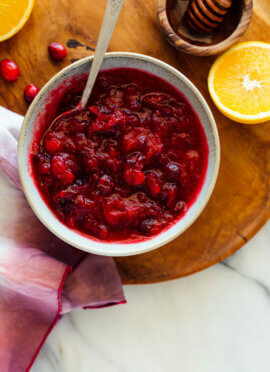 Have you considered making this recipe with organic whole cranberry sauce (drained)? I haven’t made it yet; definitely intend to! I haven’t. This recipe was a bit tricky and that would not likely be a good substitution without needing to change the recipe entirely. Let me know what you think when you try it! I opted not to use the whole cranberry sauce as soon as I opened the can. What was I thinking? HAHA! I left another post after making the recipe — a winner for sure! These muffins look and sound so delicious and I can’t wait to try them. Can I substitute sugar free applesauce for the oil. I typically use applesauce in place of oil in all my cakes & they are so moist. Hi Julie, I bet that might work but haven’t tried to be sure! Please let us know if you give it a try. Retired my muffin tin – would you have a recommendation for cook time if baked in a loaf pan? Thanks! Hey Rach, good question. I’m not exactly sure, but I’d bake at the same temp and would guess it would take around 40 minutes. Keep an eye on it before then though! I’m going to laminate this recipe. Back in the day, the Christmas morning treat in our family as we opened presents was Cranberry Bread. Sadly the old-style recipe used not-so-good-for-you ingredients (like Crisco), so I stopped making it. These muffins will revive our tradition. They are even better than the old bread — lighter and tastier. I love that! Thanks for sharing, Jeanne. Can I use fresh frozen cranberries? I didn’t try it, but it might work. I would recommend thawing them first. They might be a little more moist to start. Let me know what you think! This recipe was delicious and I loved the method for pulsing the cranberries. I used mandarin oranges because they were all I had and put some of their juice in too. I had these for breakfast alongside plain greek yogurt and gave some to my daughter too. My favorite part of the recipe is your descriptions of what each ingredient added to the muffins. Delicious! Thanks for trying this one, Emilie! I’m glad you loved it. Made these last night. My house smelled awesome and they tasted great! I added a little cream cheese icing from one of your other recipes. Yum! Thanks for hanging in there and doing all the perfecting in your test kitchen, Kate! I’m glad they tasted and smelled amazing! Thanks for your review, Brenda. Kate, you did it again! Another fantastic recipe! So flavorful and the aroma of these baking were wonderful. I know whenever I make one of your recipes, I never have to change a thing. Thank you for another great recipe! Thank you, David! I appreciate your review. I’m glad you have such confidence with my recipes! Have you tried these with dried cranberries? I haven’t! The fresh cranberries work the best with the orange. You are my hero! I made these this morning & they were delicious! My salads are transformed and you inspire my cooking continually. And I have shared your website & cookbook with all my friends! Thank you & Happy Holidays! Happy holidays to you as well, Marie! I’m glad you love these muffins and salads. Just my luck to have bought three of your cookbooks and NOW Amazon puts the $5 back. Oh wells…two are wrapped and under respective trees, and the other has been used for several recipes. 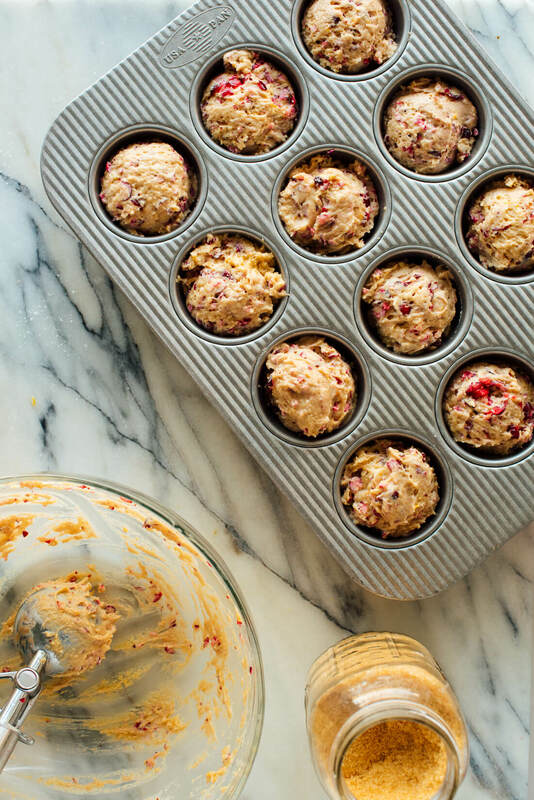 Having said that, I’m about to make these cranberry/orange muffins but wonder if you have an answer for a couple of the people who questioned something I was wondering about…how would you go about using dried cranberries in this recipe if that’s all you have? I found the fresh, but they aren’t available all year long. Hi Jean! Thank you so much for your support! I hope you got the books at a good price nonetheless. :) That is a good question about dried cranberries and I will try to make a note of it in the recipe. Since dried cranberries are already sweetened (so they retain some moisture) I would recommend going back to my standard flour and sweetener amounts (I had to increase both in order to obtain sweet-enough muffins since raw cranberries are so tart). So I’d suggest using about 3/4 cup dried cranberries, 1 3/4 cups flour and 1/2 cup honey or maple syrup. Please let me know if you give this a try! Made them with Olive Oil & Maple Syrup. Really enjoy the perfect balance of tart and sweet and of course they are so pretty to look at as well! Thanks for a new family favorite Kate! Does all purpose flour work instead of whole wheat? I made these today and they are delicious. I made them in those heavier than paper cups that I bought at Homegoods and may not have left them in the oven quite long enough. I love those paper cups that I just set on a cookie sheet (no clean up). When, not if, I make these again I will bake a little longer. I also used whole whear flour not white whole wheat and none of that heavy wheat taste. Thanks for a delicious recipe. I made these and loved them. Cooked a bit longer, probably because my cranberries were frozen. I used corn syrup instead of honey. I know, likely not as healthy, but cheaper. Everything else I left the same. My 8 year old daughter surprised me and loved them too. Thank you for sharing! I’m glad you both could enjoy them, Sherry. I appreciate the review. Very, very good! We’ve made these twice in the last three days for breakfast, and neither batch lasted past lunch. I used frozen cranberries, pulsed them in the food processor while they were still slightly frozen to keep them from turning into mush, and then thawed them the rest of the way, drained out any extra liquid, and patted them dry with a paper towel – worked great! I love it! Thanks, Emily. These were delicious! I used 2 flax eggs and creme fraiche instead of real eggs and Greek yogurt because they’re what I had on had. Topped with coconut sugar before baking to help them carmelize on top. Yum! Just made these and they came out great. I even bought the muffin tin you recommended, which worked much better than the silicone one I was using. Chopping the cranberries was a genius idea to tone down their tartness. I also added a quarter cup of crystallized ginger because I love the combination of cranberries, orange and ginger (and I had a bunch leftover from Thanksgiving). Love it, Gail! Thanks so much for sharing. I appreciate your review. Hi Kate, these are so good!!! I tried them after seeing your post on IG and have made them a couple of times already for my husband’s breakfast on-the-go. The only change I made was to throw in some walnuts which turned out great. Your muffin recipes are so simple and delicious, thank you! Love it, Angela! I’m glad you like them so much and my other muffin recipes, too. Thanks for the review! Love your cookbook and always thrilled when a new recipe hits my inbox. Wonderful, Amy! Thanks for trying these. I’m excited you love the cookbook, too! These are amazing! Perfect holiday flavors and healthy to boot. We ate them every day for a week and I still craved them – on to make a second batch! Will I get the same results if I use almond flour, instead of whole wheat flour? If so, do I still use the same amount of flour? Unfortunately, almond flour isn’t a 1:1 substitute. If you need a gluten free option, I would recommend a gluten free all purpose flour. Kate, my family loves these! I’m on my third time making them for my kids, and had an idea to take them to a few neighbors for Christmas….but they’re older and I’m not sure they’ll appreciate the goodness of whole wheat and honey…so I was wondering if I use white flour and white sugar will these turn out the same? You might be surprised! I don’t cook with white flour, but it should be similar. Although baking can be tricky so they may turnout slightly different. I made these muffins for my coworkers. They were delicious!! I hope we get a new cookbook soon from you Kate. Almost all my meals are from Your cookbook or blog. Other recipes disappoint me. Thank you for keeping us healthy and satisfied. Made as written and these are fabulous! I’ve been looking for several years for a good cranberry orange muffin recipe that wasn’t loaded with sugar. Made this for a family of six that was visiting and I got 6 regular size muffins (for the adults), 14 mini muffins (perfect size for kids) and a small loaf (bonus—to gift a friend)! Guess I didn’t fill the pans enough, but they look lovely and full. Thank you for another great recipe! Made these a couple of days ago and saved them to my tried and true recipe board. I’ll definitely be making them again. I used maple syrup and threw in a couple of spoons of bran to get more iron in. They’re the perfect sweetness level. Thanks for the recipe. Love these! Have made both Cookie& Kate’s healthy zucchini & pumpkin muffins, so couldn’t wait to try these. And they did not disappoint. Moist, perfectly sweet enough & delicious. I used regular buttermilk, regular whole wheat flour, added 1 tbsp each of chia seeds, mulled flax seeds & wheat germ (as I always do to all muffin recipes) & about 1/4 cup chopped walnuts. Also I make 6 jumbo muffins, instead of 12, and increase baking time. 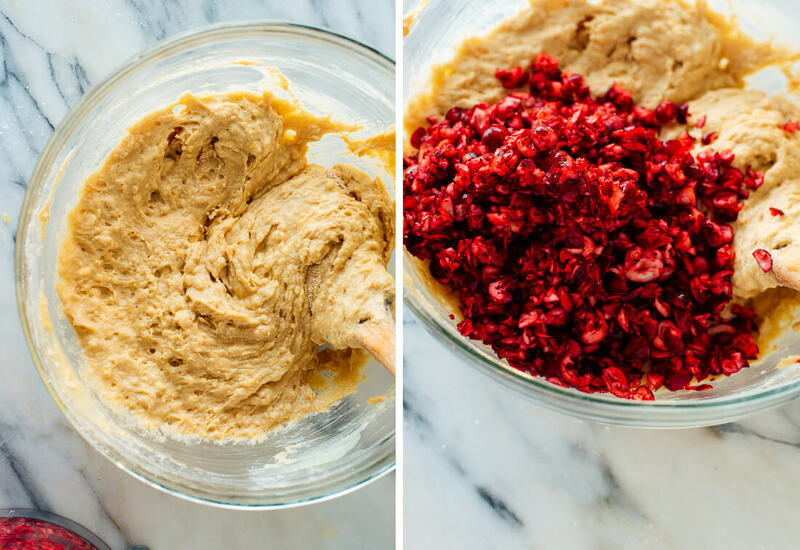 My new go-to cranberry muffin recipe! So happy I found this website! Thanks for sharing! I’m happy you found the blog too, Chris. These were outstanding!! Kate, your muffin game is ON POINT! Well, thank you Julie! I’m glad you loved them. These muffins taste just like the ones my mom made me when I was a little girl! I used chia eggs and vegan buttermilk and they turned out fabulous! Thank you for another great healthy muffin recipe! You’re welcome, Caroline! Thanks for trying them! Made these for Christmas brunch — delicious. I used vanilla coconut milk yogurt bc they didn’t have the plain. Substituted whole cranberries for apple juice-sweetened dried cranberries (maybe 3/4 cup). I want to try fresh organic blueberries next time. They came out great and looked beautiful all “puffed up” on the top. Love your online recipes, very helpful tips and your cookbook too! Thanks for sharing and for your review, Reva! Thank you for another wonderful recipe. These turned out great, like all your other muffins. These might be the best yet. I never cease to be amazed at how fluffy whole wheat baked goods can be. I cut back maple syrup by 1/8 of a cup and they were sweet enough for my taste, but I don’t like my muffins too sweet. I added a few tablespoons of water to compensate for less liquid. I have enjoyed several of your recipes this holiday season, will leave my reviews on those pages. Best yet? I will take it! I’m a big fan myself. Thanks so much for your comment and review, Cora. I made these over the holiday break to use up some leftover cranberries. They were really great! Thanks for sharing. You’re welcome!! Thanks for your review, Lauren. Muffins winning! Thanks for sharing, Robyn. Loved these muffins! So full of cranberries. They are light & fluffy. They disappeared quickly. I’m glad they didn’t last long. Thanks for the review, Ann! 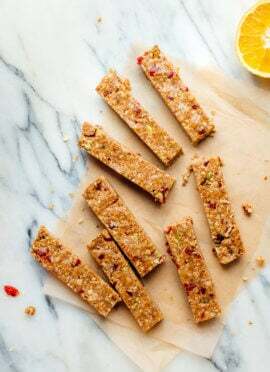 I found this recipe last weekend and decided to try them for a healthy new year snack but they were so good they didn’t make it to the new year! I had to make them again this weekend as they were a huge hit. They are hard to not eat right up! Thanks, Erin! Delicious!! I made these with the buttermilk/dried cranberry/.5 cup honey subs and they turned out great! Next time I want to try with fresh cranberries. I’m glad they worked with dried! Thanks for sharing what you did! Has anyone tried making this recipe with craisins? I recommend doing a search of the comments to see. I know a lot of people have asked and I wouldn’t know for sure without trying it for this one. It was a bit tricky as you can see from my post. Be sure to comment what you think if you do try it, Ashley! I make your muffins all the time but these were AMAZING! You’re so sweet! I want to make sure it will work and be delicious. Thanks for your review, Diana! these are nothing short of delicious. made them today for my friends. yummmm. and healthy! I’m glad you loved them, Kaitlyn! Enjoying one with my coffee this morning! These are fantastic i appreciate the effort you put in to get them to perfect! Just made these and they’re fantastic. Didn’t rise very well, but that could’ve been because I subbed half of the flour for oatmeal … ? That would be the case, Olivia. Typically, you can substitute oats for flour. You could add 1/3 oats in addition and that should work ok. It works for most my other muffin recipes. These are amazing! Taste better than a box mix and uses healthy ingredients so you can’t feel too guilty eating more than one. I’m glad you like them, Christa! I made your delicious Fluffy Cranberry Orange Muffins and love them! I usually slice my cranberries for the pretty star design, but I chopped them in a blender this time and actually prefer how much more red the chopped pieces look. I shared some with my neighbors and they love the recipe, too. Absolutely delicious! Super moist and flavourful! Mine did stick to the bottom of the muffin papers (they were the cheapy child’s cupcake papers) so will try again (yay) with better Paper Chef parchment liners. I’m glad you liked them, Kim! You can try to oil the bottom if you need to. I appreciate the review. This looks great. Can’t wait to eat it. Let me know what you think when you try it, Heather! Great to hear, Sandra! Love the peptias! To borrow a phrase from Mary Berry, these are quite scrummy! 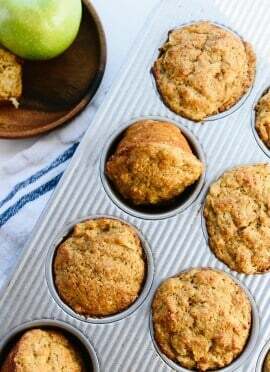 I was thrilled to find your recipe as a healthier version of these muffins. I used coconut oil and honey and non-fat Greek yogurt, zest from a large orange (extra flavor, no complaints! ), plus I added a generous tsp of cinnamon, and I used demerara sugar instead of turbinado. I am so thrilled with the flavor and moistness of these! The honey & vanilla add a comforting richness to the flavor and a balance to the tart cranberries. For some reason, I had batter leftover after filling my 12 muffins, enough to make two jumbo muffins which took an extra 10 minutes to bake. I’m going to give some of these to my neighbors who always help me with shoveling. As I am a fan of making apple cranberry pie, I’m thinking of adding some grated apple to my next batch to give them that flavor combo as a variation. But this recipe is a keeper; you definitely have a winner with this one!!! Awesome muffins Kate. My boyfriend says best ever! I agree. Question…living in southwestern Ontario, fresh cranberries are only available seasonally around Christmas. But sometimes I can find fresh-frozen during other times of the year. Would they be too “wet” after they are thawed out and alter the results? I remember reading your description on how hard you worked on getting the right balance of moisture in this recipe. Thank you…I have your book…also, I’m vegan so I appreciate all your efforts to accommodate that choice. Best ever, I love it! Thanks for sharing, Diana. I would worry about the additional moisture, but I don’t have specific tips for you with this one. If you try it, let me know! Moist and tasty, healthier than most. Touches all the bases. Also quite a simple method. Thanks for doing the work, it clearly made the difference. This was a great recipe! They looked gorgeous and were nice and large and not overly sweet. My daughter inhaled them! I used frozen Cranberries and pulsed them when they were half frozen. No extra liquid off them like other frozen fruit. I used vanilla Greek yogurt and honey and olive oil. Has anyone tried replacing the oil with applesauce. I normally do that in recipes but I wonder if it would make them way too moist as I found it was a moist dense cake texture. I’m happy you liked it, Lisa! I’m not sure on the applesauce, but you could see in the comments from other readers what they suggest. Going to make this today but we couldn’t find fresh cranberries! Got frozen….How should I go about this? Just thaw and treat as the fresh ones? I’m sorry for my delay! Frozen has worked well for some. Checkout the comments to see what others recommend! You’re welcome, Chris! Thanks for the review! I was just looking over your receipt the fluffy and cranberry and orange muffins, I was just wo drying if I couldn’t get hold of fresh cranberries, would dried cranberries or frozen ones be alright and if do Hi will would I need to use? Hi ALexandra! I know some readers have used frozen. I would check the comments to see what they did. Way too much hype cranberry. Use half! I’m sorry you didn’t love it. Thanks for your feedback!